A beautiful and difficult action-RPG that rewards risk-takingthe complex magic system makes up for the bits that just arent worth playing over and over. I'm staring into a vast desert. The subterranean streets and ice canyons from earlier levels are gone, along with their looming, claustrophobic atmosphere. The power in my hands has brought me step by step, mile by mile, to this field of dust and dark ruins. My magic finally seems strong enough to match the hatred and fear that fills the world. I'm not bullied anymore, just determined. Lichdom: Battlemage lets me be exactly the kind of lightning wizard I've always imagined—cruel, merciless, and power-hungry. A sandstorm blows in and I get just what I want when a group of enemies spawns in front of me. They were tough mini-bosses earlier in the game, but now they give me a chance to show what I can do. Lichdom's first-person camera makes every encounter feel urgent and dangerous, though, and even with a few new tricks to show these winged demons, I have to stay agile. After cursing a beast with necromancy, I trap it with a kinesis spell before charging a critical lightning strike. A few seconds later the monster is suitably crispy from all the electrostatic violence and in its place I now have a creeping minion to fight for me. Did I mention I love storm magic? Xaviant's action RPG likes to give players several dimensions of danger to consider at the same time. Yes, it's about being a powerful magic user—a battlemage—but it's also about being able to use your mind to solve problems that aren't immediately obvious. Have I crafted and synthesized enough of the right spell materials to match these opponents? Is this challenge really more about defense than offense? How I was able to answer these questions became my personal test. My success usually depends on how well I combine twitchy defensive movement with the right combination of control and destruction magic. Within each of Lichdom's eight magic schools—called sigils—players can craft spells from components collected on the battlefield that focus their arcane arts in one of three areas: a targeted range attack, a defensive magical shield, and an area-of-effect spell. Inside each of these subgroups is an additional layer of specialization—destruction, control, and mastery. Destruction emphasizes pure damage output, while control will afflict enemies with different obstacles that slow them down or paralyze them for brief periods. Mastery is an effect that stacks damage in different situations and is vital in order to stand up to some of the game's more difficult enemies. Beyond the visually stunning spell effects, the various sigils interact with each other in mysterious and surprising ways that reward experimentation and risk-taking. The inventory system where I organize, craft, and manipulate spell components in Lichdom is both immediately familiar for its color-coded loot system as well as frustratingly cumbersome. White is the most common, with greens, blues, purples, and rare orange. There are a lot of stats to work through, and due to the checkpoint save system—which forces a loot grind even when it isn't beneficial—my inventory fills quickly with a mashup of different items that then demand management. It often feels more like housekeeping than an expression of ingenuity or power on my part, but the forced accounting did push me into the crafting system to experiment and take some chances with spell types and combinations I normally avoid out of habit. By altering my approach through necromancy or the mind-control spell type called delirium, new and satisfying strategies became possible. Inventory management became a chore during the late-game period, but I appreciated being nudged toward experimentation. Still, the checkpoints can be tiring. 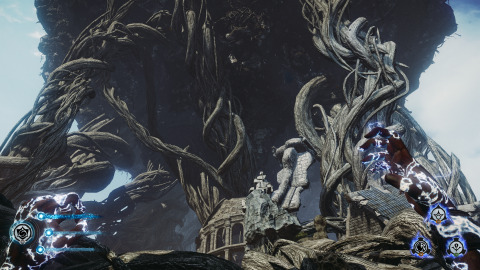 As pretty-looking as most of Lichdom's world is, there was more than one occasion where I grew tired of treading the same ground. Some checkpoints are placed remarkably close while others are separated by large mobs of enemies that, even when they pose no special danger, take many minutes to push through—more often than not, I just wanted to get on with it. Lichdom's loot system is built around these checkpoints—the more checkpoints I can link together without dying the better the spell-crafting material I get—which is interesting, but when a tough mini boss has my number and the loot rarity level resets with every death, it becomes a grind that can't be avoided. I pushed through, though, and it was worth it. Lichdom's story of revenge as the hand-picked, resurrected avatar of a mysterious sorcerer named Roth is a familiar one, but Xaviant's take on evil cultists and undead monsters is told well, especially in the setting. While I stopped to collect journals and referred to them occasionally, the best parts of the story are built into the world itself: a shattered moon in the sky, a derelict underground city, the empty hulks of a long-lost fleet frozen in a glacier. Beyond the excellent environmental storytelling, the voice acting by Jennifer Hale and Troy Baker as the female and male protagonists make them convincing inhabitants of the world. With every new game, players choose whether to play as a male or female mage, and each has seen first-hand the consequences of resisting the death-worshipping Cult of Malthus. The story is tense—the pressure building in concert with my quest for more powerful magic—and its take on death and resurrection manages a very strange turn or two, but in a way that made me laugh and pushed me forward. Back in the desert, I'm not done pushing through this skirmish. A pair of growling, tentacled, energy-spitting abominations arrive to test my resolve. With a quick-blinking shield built for dodging maneuvers and a handful of ghostly soldiers fighting on the front lines for me, I'm more than ready. Earlier in the game, just one of these things would send me backtracking into cover. But the sand dunes give me fewer places to hide and I'm tired of running—my undead battalion does its job distracting them while I lance the beasts with lightning. Standing over their vaporized remains, I'm happy with my work. It's the kind of moment that makes up for all the sweat and toil that came before. Lichdom is a sharp-looking, complex take on sorcery. Its classic story of wizarding revenge and challenging magic system encouraged me to devise new ways to burn, smash, and corrupt my enemies. The cost for all that fun is a lot of trial-and-error learning and tedious inventory management, but it's a price my storm wizard was happy to pay.